The Korean Peninsula extends southward from the northeast part of the Asian continent between 33 degrees and 43 degrees North Latitude and 124 degrees and 132 degrees East Longitude. The standard meridian of the peninsula is 135 degrees. Local time is nine hours ahead of GMT. The Amnokgang and Dumangang Rivers border both China and Russia to the north, and Japan is just across the East Sea. Since 1945, as a result of the Cold War tension, the peninsula has been divided at the 38th parallel degrees North Latitude into the Republic of Korea, or South Korea, and the Democratic People's Republic of Korea, more commonly known as North Korea. The total area of the peninsula is 222,154 km2, which is similar in size to that of the U.K., New Zealand, or Romania. 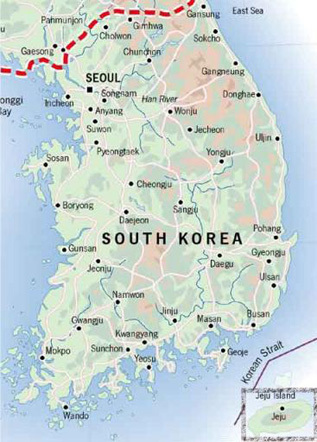 South Korea possesses 99,373 km2 or 45% of the total land mass, and North Korea 122,762 km2, the remaining 55%. About 70% of the land is mountainous, with the main concentrations to the north and east. Along the southern and western coasts the mountains descend gradually toward broad coastal plains. Most of the rivers have their tributaries on the north and east sides more than 3,000 and flow into the Yellow and South Seas. Clustered for the most part on the southern coast, islands are of various sizes provide scenery unparalleled throughout the world. Koreans, like many other Asian peoples, are descendants of the Mongolian Tungus stock. They differ from the neighboring Japanese and Chinese, however, in that Koreans are a homogeneous ethnic group with their own language, culture, and customs. Korean people are characterized by their generosity, warmth, and kindness, and are renowned as some of the hardest working people in the world. Rice, either plain or cooked with other grains, is the main dish at Korean meals. Rice is accompanied by a variety of side dishes that vary greatly according to the region and the season. Next to rice comes kimchi, a spicy vegetable dish generally comprised of celery, cabbage and turnips or cucumbers seasoned with salt, garlic, onions, ginger, red pepper and shellfish. Soup is also a vital part of almost every meal. Other dishes include seafood, meat or poultry, greens, herbs and roots. Each person has his own rice and soup bowls but all other dishes are placed in the center of the table for everyone to partake of. A spoon and chopsticks are used for eating. A favorite dish is pulgogi, strips of beef roasted over a brazier at the table after being marinated in a mixture of soy sauce, sesame oil, sesame seeds, garlic, green onions and other seasonings. Koreans generally like hot, spicy foods, so red pepper is an indispensable seasoning.